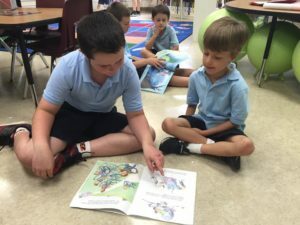 We are proud of our community spirit and are pleased to offer a warm and welcoming environment for new families and students as they advance through St. Joseph School. Designed to help new families become part of St. Joseph School, new and existing families are paired up so the new family has someone they can go to when they have questions about St. Joe’s. The existing family is asked to “show them the ropes,” help introduce the family, and check in with them to be sure their transition to St. Joe’s is as easy as possible. Extended Care offers before and after-school care for K-8 students. 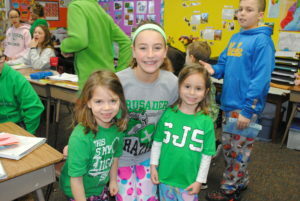 The program, directed and run by St. Joseph teachers and aides, includes time for homework, play and snacks. You only pay for the hours your child attends the program. In the morning, children attend the program in the Learning Resource Center. After school, students meet in the gym for check-in; activities follow, including snack and recess. The school provides snacks, computers, books, toys, games and art supplies. Holiday Care is available for many school holidays. Typical holidays covered are Columbus Day, Parent-Teacher Conference Day, Veteran’s Day, the day after Thanksgiving, during Christmas break, Martin Luther King Jr. Day, President’s Day, Spring Break and Easter holiday days. First Student provides bus service for a cost of $25 per student. 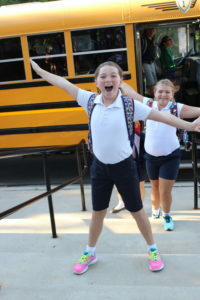 K-8 students arrive by 7:45 am and are dismissed at 2:20 pm. 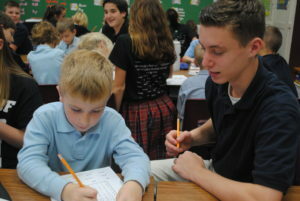 “Bus Buddies” (older students) are assigned to guide Kindergartners to buses. St. Joseph School offers an optional hot lunch program. On Mondays and Wednesdays lunch is ordered from a variety of local restaurants. Pizza lunch is offered on Fridays.